You are here: Knowledge Base » Ecommerce » What is Ecommerce? With MailChimp's Ecommerce functionality you can integrate your WooCommerce shop with your MailChimp list. This allows you to view which campaign generated which purchases and set up powerful list segments based on the purchase activity of your subscribers. 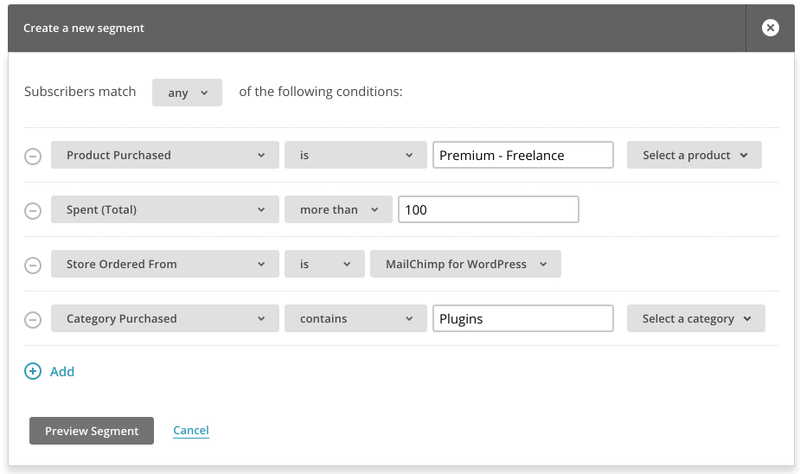 MailChimp for WordPress supports full Ecommerce integration including Abandoned Cart emails and Order Notifications. To start adding orders to MailChimp, go to MailChimp for WP > Ecommerce and connect your WooCommerce store to one of your MailChimp lists. With Ecommerce enabled, every new purchase will automatically be sent to MailChimp. If the customer was coming from one of your email campaigns, the plugin will automatically detect this and send the campaign information to MailChimp as well. Orders aren't sent to MailChimp right away during checkout. Whenever someone places an order, the plugin creates a task to be picked up at a later time. This means that the performance impact on your checkout is literally close to zero. Because of this it may take few minutes before order information shows up in your MailChimp account. Normally purchase activity for any of your subscribers should appear in your list within the hour. Right after enabling Ecommerce and connecting your store, the plugin will take you through a few steps to connect your store and synchronise your WooCommerce products and orders with MailChimp. If you have a lot of orders, adding products and orders with WP-CLI will be a lot faster. Because all work is performed in the background, the plugin keeps a "debug log" where all interesting events are written to (like when an order is sent to MailChimp). This enables you to keep track of what the plugin is doing in your absence. Read our article on enabling debug logging for more information.